WATKINS - If Luke Farley feels any pressure as he prepares for his final collegiate baseball season as an Iowa Hawkeye, it certainly does not show. Farley is once again patrolling the outfield this summer with the Watkins Mud Hens of the Iowa Valley League along with taking a couple of summer classes at Iowa. He has come through with some big hits for the Hens, most notably belting homers in both ends of a doubleheader sweep at Norway earlier in the season. This past Sunday, he had a pair of hits as Watkins rallied for a 3-2 win over Walford to gain a split of a doubleheader. 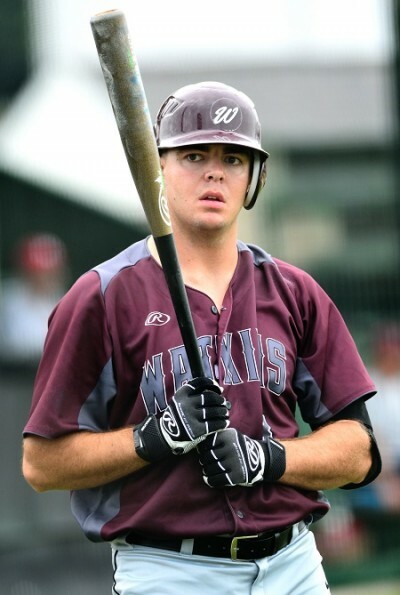 Playing for Watkins has allowed Farley to concentrate on both academics and baseball. "(Playing for Watkins) gives me an opportunity to get some at-bats in during the summer," said Farley, who has been an all-academic Big Ten selection the past two seasons. "I'm also taking a couple of summer classes right now so it helps me to get tuned up for the season." Ironically, Farley's major at Iowa is enterprise leadership. The former Waterloo Columbus all-stater is one of just six seniors currently listed on the Hawkeye roster for 2019. With the likes of Robert Neustrom, Zach Daniels and Brady Schanuel leaving a year early after being drafted, Farley will likely be counted on for a leadership role. "(My role will) probably will be determined after the fall before the season starts," said the 6-foot, 215-pound Denver, Iowa, native. "I'm just hoping to get some decent playing time this year and hopefully we can go far again as a team." The fall season will be key for Farley. For the first time in three years, there is no fall trip outside the country for the Hawkeyes. "It's been really different every year since I've been here," he said of fall workouts. "My sophomore year, we had a trip to the Dominican Republic and last summer we had the trip to Taipei (representing the United States in the World University Games). I assume this year it is probably going to be similar to my freshman year. "We'll scrimmage 2-3 times a week and stuff like that," he continued. "We just get a lot of work in during the fall. We have always worked really hard in the fall and I assume that will be the same this year as well." The 2018 Hawkeyes battled injuries but were in contention for an NCAA berth until the end of the season. Farley got two starts in the outfield and was the Hawkeyes' primary pinch-hitter. He batted .167 in 20 games. With the loss of Neustrom and the graduation of Austin Guzzo, the opportunity is there for Farley in the Hawkeye outfield. Farley is hoping to join the list of Hawkeyes who have flourished as seniors under Coach Rick Heller. He is a career .218 hitter, but said the results, not the individual numbers, are most important. "I'm definitely going to try and finish strong," he said. "Stats for me, they really don't matter. The important thing for me is the team. I just want to go out and have fun during my last year."